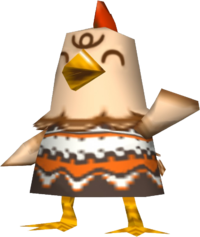 Betty is a normal chicken villager from the Animal Crossing series. Her Japanese name, Whip, is likely a reference to whipping or whisking eggs before cooking them. Her catchphrase, "cluckling", is a play on cluck, a noise that chickens make. Betty is a pale brown chicken with layers of darker brown around her neck and on her arms. She has a curl of brown hair over her forehead. Her initial shirt is the Comfy Sweater. Betty also has blue over her eyes. She has an orange beak and legs, and a red comb on top of her head. Betty is a normal villager. She will act motherly to the player and other villagers. Betty loves to cook and is very nice. She will sometimes ask the player to do a favor for her. Betty loves receiving gifts and letters. She likes it when the letters have presents. Betty likes bugs and fish and may often ask the player to catch a fish for her house. Betty also likes certain events such as the Fishing Tourney and the Sports Fair and can sometimes be seen taking part in them. She likes to talk about the town's environment and how it could be improved. She sometimes will talk about how nice flowers would look. Betty likes a specific fruit, the apple. Betty's house has a kitchen theme. She designed it well, covering the floor with Ceramic Tile and the walls with Backyard Wallpaper. Betty has the Fan, Pine Chairs and Table, Stove, and Refrigerator scattered about the room. Betty has quite nice plumage for a chicken, but she's constantly worrying that it's just not fashionable enough. As a result, she's always on the lookout for the next "big" outfit. Betty's phrase "cluckling" is reused by Knox in Animal Crossing: City Folk and Animal Crossing: New Leaf. Modified on February 22, 2019, at 23:36.